Emily has been a volunteer with Hanaeleh since May 2012. She completed the Hanaeleh’s Summer Internship Program, taught by Elizabeth, and has been a volunteer ever since. She has always wanted to work with horses and she is currently studying to get her degree in Animal Health Science. 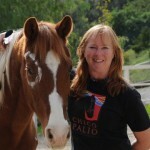 She devotes her free time to caring for the horses at Hanaeleh.